The cultivation of grapes in Nice stretches back to the third century BC when the Phoenicians planted the first vines on Nice's sunny hills. Concentrated in the Bellet neighborhood in northwestern Nice, the vineyards once extended to around 2500 acres and were exported around the world. Bellet wines were awarded AOC (Appellation d'Origine Controlée) in 1941 and their production continues even though the acreage devoted to vineyards is now only about 50 hectares. Still, the sunny microclimate insures a small but steady output of fine, but expensive, wine. The wines of St Roman de Bellet are available for sale in most local wine shops and in Nice restaurants specialized in Nice cuisine but hard to find outside Nice as production is less than 100,000 bottles a year. There are now slightly more than a dozen chateaux in Bellet devoted to winemaking. The Chateau de Crémat has the most impressive exterior. 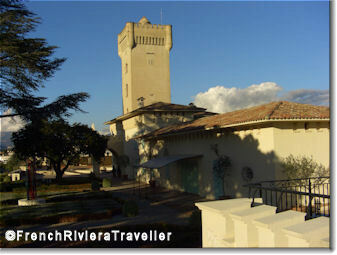 Built in 1906, the building has been impeccably restored and is topped by a crenallated tower that is visible from afar. Perhaps the most prestigious of the Bellet wines is that produced by the Chateau de Bellet. Its Baron G wine was served at the European Summit of Nice 2000 and the NATO summit of Nice in 2005. The Bellet vineyards are open to the public two weekends a year, in winter and in spring. Vins de Bellet has the schedule. 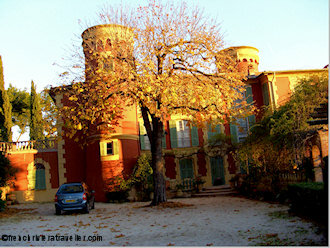 Otherwise, the only chateau that arranges individual visits and wine tastings is the Chateau de Cremat (€15). Still, a drive around the hillside makes for a pleasant excursion. The vineyards are spread over verdant hills that overlook the sea and the overall setting is calm and rustic. To experience the Wine Route head north on the route de Canta Gallet and follow the route de Bellet north or the chemin de Cremat south. The chemin de Saquier also has several small chateaux.